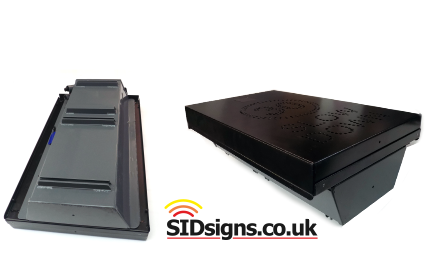 Cabinet format speed signs are built from 2mm thick aluminium which is formed and then welded into a finished cabinet design. Used to build 100's of signs the cabinet format has slowly evolved to incorporate a lot of user friendly features as well as small improvements to the overall design & operation of the cabinet. With a large hinged front the cabinet format allows easy access to the battery housing and a set of basic controls designed to make life as easy as possible. A built in key lock secures the cabinet front to the main case. 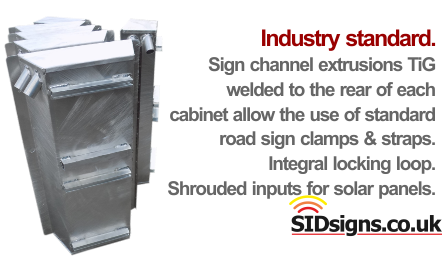 Standard aluminium sign channel welded to the rear of the cabinet allows UK standard road sign clamps to be used to secure the whole sign to standard 76mm or 50mm diameter posts. Inside the speed sign cabinet you will find some simple but very useful controls; simple push buttons which don't affect the way your speed sign works but which do allow you to check for simple problems. button. If your battery needs to be recharged you can see instantly. For mains powered formats this testing system is left in place within the cabinet. 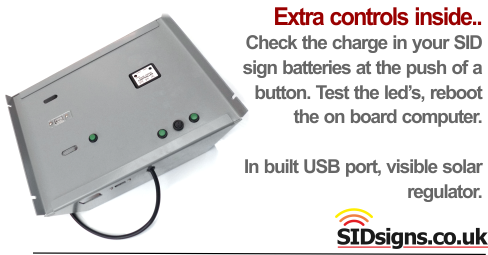 Doing this allows you to quickly & safely check that your sign has 12vDC power available. If the test lights do not illuminate there is a fault with either the mains supply or the transformer. A test button built into the speed sign cabinet allows you to check the led display. For fixed speed designs a button press confirms that the warning message lights correctly. For signs with matrix displays a special test routine automatically allows you to test that every segment of your sign not only lights up properly but follows the proper lighting sequence. With the transition to software control an extra reset/ reboot button has been build into the cabinet casing. Use this button to reset your sign anytime you like. Solar panels should not be used without a regulator, a device which conditions the incoming solar electricity and prevents damage to the rest of the sign electronics. With the cabinet format you will find a build in solar regulator which is integrated into the sign. You can see the operational leds and see whether the sign has power, whether the solar panels are connected delivering current. Cabinets can be used in conjuncture with all message types; fixed, dynamic and so on. 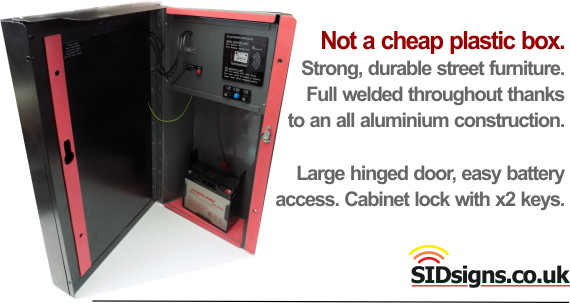 Custom enclosures and cabinets can be designed & manufactured to suit customer requirements.